Need a simple video player for displaying videos on your website (that doesn't require a degree in computer programming)? I've done some tutorials in the past on how you can convert your slides to video, but I haven't shown you how to actually get them on your site. So, in the following video I demo two very easy ways you can use to display and manage your videos. The first is one you already know – YouTube. However, it's difficult to manage all your videos there, and you have to go back and forth to find them and grab the code. The second is the tool I'm now using in place of the YouTube share url. It's a WordPress plugin called Simple Video Management System. You can see in the video that the YouTube ‘share' url is your simplest option, once you've uploaded your video to YouTube. However, if you're going to have multiple videos and display them in different places, you're far better off with the Simple Video Management plugin. Use the YouTube ‘share' url when creating a video listing in the plugin. Do NOT grab the url from the browser. With mp4 videos on amazon s3, be sure to add permissions for everyone to Open/Download. The plugin will mask the actual url. Before making edits to videos in the dashboard, check to see what pages you have that video on. For example, if you're changing the size, be sure it will display properly on pages where it's inserted. You'll see a list of all the pages/posts the video is on when you click on its listing in the plugin dashboard. Add a splash image for mp4 videos so that they look nice on the page before people click the square ‘play' button. You can load these to s3 or elsewhere and grab the url. YouTube will automatically put in a splash thumbnail. As an aside, I also own Easy Video Suite, which is much more advanced and has more bells and whistles. For example, it has different ‘players' and options to add a variety of ‘events' on your video timeline. However, unless you're doing very advanced video marketing, I'd stick with the simple option. When you start getting into complicated tools you can easily head down a rabbit hole of features that sound amazing, but which you'll rarely use (if ever). 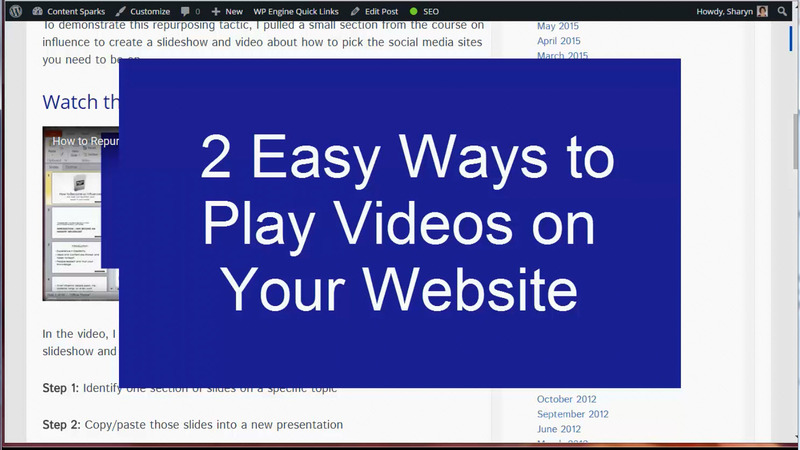 What's YOUR favorite way to play your videos on your website? That was so useful as usual Sharyn! I can’t get any of the above links to work and there is no video. What am I doing wrong. I am very interested in the plug in “Simple video” but don’t know where or how to access it. Nancy, did you try again recently? I see the video and the links right now. Earlier today there was a problem because I didn’t realize I had to re-enter my license key when I updated to the latest version of the plugin. They’ve made a bunch more improvements, including not needing to do that in the future, but I had an early version.